Banks have not exited the mid-market or SME space, but are following a different route to access this lucrative market segment. Banks provide private debt funds, fund of funds and fintech lenders with asset-backed facilities and warehousing lines. The leverage facilities are structured like private CLOs without tranching and include the setting up of an SPV with terms: advance rate, deployment and amortization periods, final maturity date, financial and performance-triggered covenants (performing loans and deployment percentage), eligibility of receivables, diversification requirements, regulatory trigger events and risk retention requirements. 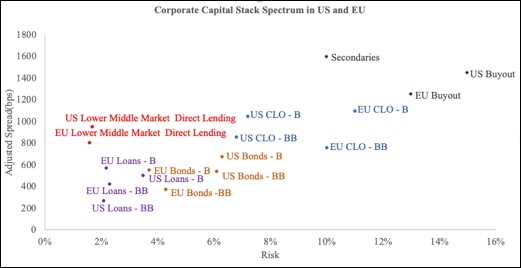 Interestingly enough, banks remain the main player for lending in Europe as shown in Figure 3, whereas alternative lenders have substituted banks on the other side of the Atlantic. The room for bank substitution compared to the US combined with the reduced lending activity from banks as shown in Figure 4, highlight an opportunity for alternative lenders to become the stepping stone for funding the mid-market, lower mid-market and SMEs. The European Union and European Commission are considering SMEs to be the backbone of the real economy and are focusing on funding this segment of market. According to ICG data, European private companies’ fundamentals remained strong in 2Q18 with high interest coverage and senior debt rising as evidenced in Figure 5. Both senior debt and interest coverage are at all time high since the financial crisis, a statistic which is very supportive of the economy’s outlook despite the current late credit cycle. As we start to observe more defaults and delays in payments in the credit market, we need to stress the importance of seniority and experience in distressed situations. We expect senior lending and distressed debt closed-ended strategies to perform better during the current cycle in case funds are raised at this stage and capital deployment starts early in 2019. Senior lending remains very attractive on a risk-return basis, providing institutional portfolios with uncorrelated sources of income compared to other private and public fixed income/credit strategies. There is embedded complexity and an illiquidity premium that investors can harvest with very low volatility and predictable cash flows. Lending funds have simpler and quicker credit and execution processes that justify higher pricing than banks and can invest across the capital structure. Senior secured and unitranche are the most common structure within debt funds, with unitranche being used by the same lender to enhance the returns with higher EBITDA multiples or higher LTV, but still being the most senior or sole lender in the capital structure. 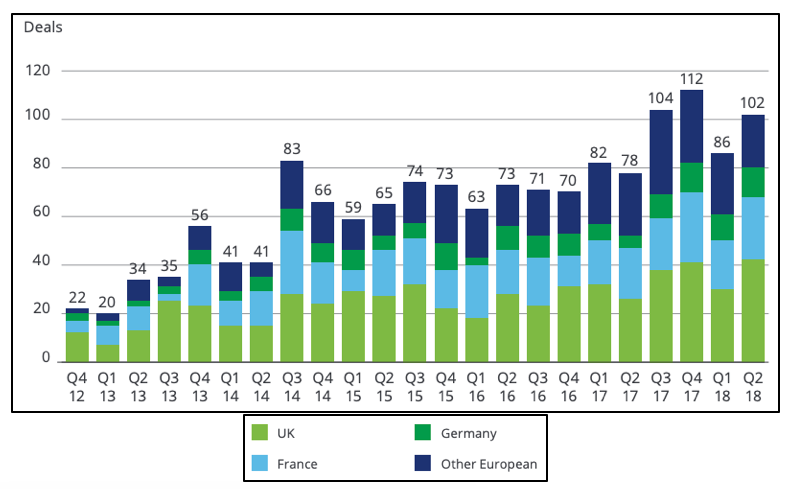 Lending activity in Europe has peaked and 2Q18 was one of the most active since 2012, majority of which was originated in the UK. Since 2012, 1510 lending deals have been originated, 581 of which were based in the UK. Lending deals have increased significantly since 2017, showing signs of strong appetite for debt. There is an interesting distinction between funds that do sponsored deals and those who do exclusively non-sponsored. Investors usually prefer non-sponsored due to higher spread as they usually yield 100-200 basis points higher than sponsored. This premium is essentially the reduced risk as sponsored transactions have usually fully detailed due diligence reports and professional financial reporting systems. The management team should be diligently selected by the sponsor to execute a well-designed strategy. The above factors should be always considered based on the sponsor’s savviness and expertise in the industry. We believe that portfolios should have a mixture of both due to deal characteristics diversification but should be mainly non-sponsored with the credit team relying fully on their credit underwriting standards. Stone Mountain Capital Partners is providing senior secured and unitranche European Direct Lending to the Lower Middle Market in Northern and Western Europe. In Stone Mountain Capital, we believe that comprehensive alternative investment advisory should reach across asset classes and interface between illiquid investments like real assets, infrastructure, venture capital, private equity, private debt, real estate and more liquid investments like absolute return strategies, hedge funds and fund of funds. Our main target is to achieve an optimal asset allocation for our clients in terms of performance, risk and liquidity under consideration of investment structure, size, and track record. Cross asset advisory implies an in-depth analysis of asset specific risk factors. Therefore, we provide the most sophisticated credit, market, operational, liquidity and integrated risk advisory. This perspective is neither an offer to sell nor a solicitation of an offer to buy an interest in any investment or advisory service by Stone Mountain Capital LTD. For queries please contact Alexandros Kyparissis under email: alexandros.kyparissis@stonemountain-capital.com and Tel. : +447843144007. For further information around our research and advisory services please contact Oliver Fochler under Tel. : +447922436360 and email: oliver.fochler@stonemountain-capital.com. Stone Mountain Capital is an advisory boutique established in 2012 and headquartered in London. We are advising 30+ best in class single hedge fund and fund of fund managers across equity, credit, and tactical trading (global macro and CTAs). In private equity and private debt, we advise 10+ general partners across the sectors real estate, infrastructure / real assets and capital relief trades (CRT) by structuring funding vehicles, rating advisory and private placements. As per 19th July 2018, Stone Mountain Capital has total alternative Assets under Advisory (AuA) of US$ 52.3 billion. 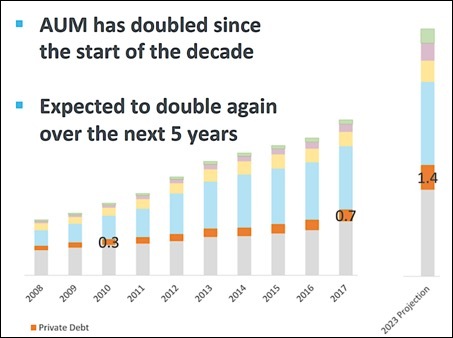 US$ 48.2 billion is mandated in hedge fund AuM and US$ 4.2 billion in private assets (private equity / private debt / real estate) and corporate finance. Stone Mountain Capital has arranged new capital commitments of US$ 1.28 billion across hedge fund, private asset and corporate finance mandates. Stone Mountain Capital has been awarded over 20 industry awards for research, structuring and placement of alternative investments. We are able to source any specific alternative investment search and maintain relationships with dozens of best-in-class hedge fund managers, private equity and private debt general partners (GPs) and real estate and infrastructure developers. We don’t pass any costs on to our investors, since our compensation comes from our mandated managers, GPs and developers. Please contact us, should you require further information about our solutions. Stone Mountain Capital is a limited company (LTD) registered in England & Wales with registered number 8763463. The registered address is: 31 Compayne Gardens, London NW6 3DD, England, United Kingdom. Stone Mountain Capital LTD is registered (FRN: 729609) as Appointed Representative with the Financial Conduct Authority (‘FCA’) in the United Kingdom. Stone Mountain Capital LTD is the Distributor of foreign collective investment schemes distributed to qualified investors in Switzerland. Certain of those foreign collective investment schemes are represented by First Independent Fund Services LTD, which is authorised and regulated by the Swiss Financial Market Supervisory Authority (‘FINMA') as Swiss Representative of foreign collective investment schemes pursuant to Art 13 para 2 let. h in the Federal Act on Collective Investment Schemes (CISA). Stone Mountain Capital LTD conducts securities related activities in the U.S. pursuant to a Securities and Exchange Commission ('SEC') Rule 15a-6 Agreement with Crito Capital LLC, a U.S. SEC registered broker-dealer, and member of Financial Industry Regulatory Authority (‘FINRA’), Securities Investor Protection Corporation (‘SIPC’) and Municipal Securities Rulemaking Board (‘MSRB'). All information in this perspective including research is classified as minor acceptable non-monetary benefits ('MNMB') in accordance with article 11(5)(a) of the MiFID Delegated Directive (EU) 2017/593 and FCA COBS 2.3A.19. This research may contain forward-looking statements concerning business, operations and financial performance. Any statements that are not of historical facts may be deemed to be forward-looking statements. You can identify these forward-looking statements by words such as "believes", "estimates", "anticipates", "expects", "plans", "intends", "may", "could", "might", "will", "should", "aims", or other similar expressions that convey uncertainty of future events or outcomes. Forward-looking statements include statements regarding our intentions, beliefs, assumptions, projections, outlook, opinions, analyses or current expectations concerning, among other things, results of operations, financial condition, business outlook, the industry, sector or region in which we operate or for which we provide research and the trends that may affect the industry, sector or region or us. Although we believe that we have a reasonable basis for each forward-looking statement contained in this research, we caution you that forward-looking statements are not guarantees of future performance. All of our forward-looking statements are subject to known and unknown risks, uncertainties and other factors that are in some cases beyond our control and that may cause our actual or our research results to differ materially from our expectations. Except as required by law, Stone Mountain Capital LTD undertakes no obligation to publicly update any forward-looking statements for any reason after the date of publication in this research, our website, or on linked websites, whether as a result of new information, future events or otherwise. Investments in alternative investments are speculative and include a high degree of risk. Investors could lose their entire investment. Past performance is not necessarily indicative of future results. The risk of loss in trading interests can be substantial. You should carefully consider whether such trading or investment is suitable for you in light of your financial condition. Alternative investments are suitable only for persons who are able to assume the risk of losing their entire investment. Alternative investments often engage in leveraging and other speculative investment practices that can work against you as well for you; may increase the risk of investment loss; can be highly illiquid; may have restrictions on transferring interest; may have no secondary market nor is one expected to develop; are not required to provide periodic pricing or valuation information to investor; may involve complex tax structures and delays in distributing important tax information; are not subject to the same regulatory requirements as mutual funds or other investment vehicles; can have volatile performance; may be subject to substantial fees and charges for management, performances, advisory and other fees compared to other investment vehicles, and these fees and charges can offset profits. Alternative investment managers have total trading authority over their funds. Some portion of alternative investment trades may be executed on foreign exchanges. No action is required if you wish to remain in contact, however please reply if you want your details removed by contacting us at info@stonemountain-capital.com or by using the unsubscribe button below. Copyright © 2018 Stone Mountain Capital LTD. All rights reserved. Any business communication, sent by or on behalf of Stone Mountain Capital LTD or one of its affiliated firms or other entities (together "Stone Mountain"), is confidential and may be privileged or otherwise protected. This e-mail message is for information purposes only, it is not a recommendation, advice, offer or solicitation to buy or sell a product or service nor an official confirmation of any transaction. It is directed at persons who are professionals and is not intended for retail customer use. This e-mail message and any attachments are for the sole use of the intended recipient(s). Our LTD accepts no liability for the content of this email, or for the consequences of any actions taken on the basis of the information provided, unless that information is subsequently confirmed in writing. Any views or opinions presented in this email are solely those of the author and do not necessarily represent those of the limited company. Any unauthorised review, use, disclosure or distribution is prohibited. If you are not the intended recipient, please notify the sender by reply e-mail and destroy all copies of the original message and any attachments. By replying to this e-mail, you consent to Stone Mountain monitoring the content of any e-mails you send to or receive from Stone Mountain. Stone Mountain is not liable for any opinions expressed by the sender where this is a non-business e-mail. Emails are not secure and cannot be guaranteed to be error free. Anyone who communicates with us by email is taken to accept these risks. This message is subject to our terms at: www.stonemountain-capital.com/disclaimer.